Vega fuels Rainey Street with the power of plant-based nutrition. Experience The Power. Plant. 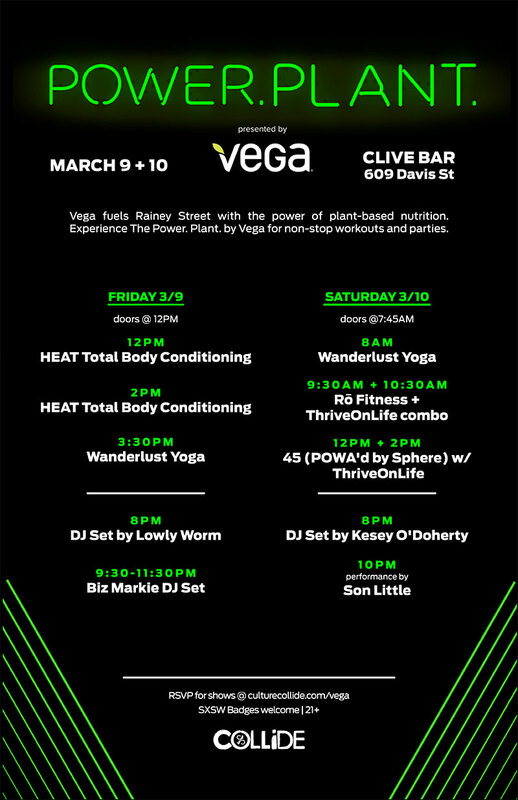 by Vega for non-stop workouts and parties. HEATBootcamp – HEAT Bootcamp is unlike any workout you’ve ever done. A combination of strength training, cardiovascular intervals, and core conditioning to give you the lean, toned body you’re looking for. In fact, it’s so unlike anything else, that sometimes EVEN WE don’t know how to describe it. Wanderlust Yoga – Wanderlust’s mission is to help you find your true north — to cultivate your best self. We gather experts, practices and recipes for living to guide your journey toward a mindful and inspired life. The backdrop is music, music, music — the food of love. Through sharing practice, food and ideas, community forms and thrives. Ro Fitness – We bring you total-body cardio that works all the major muscle groups in one workout. ThriveOnLife – At ThriveOnLife in Downtown Austin, we program a blend of STRENGTH, CORE, and high intensity INTERVAL training to give our clients the most effective workout available.